This year, homeowners spend about $10,500-16,500 to install 1,500 sq.ft of engineered wood siding on a simple ranch style home. It is an ideal option for people who want the look of real cedar, without the high cost and maintenance. Over the past 3-5 years composite wood siding has been steadily gaining popularity. Homeowners and builders love the style and color choices, as well as a very realistic wood grain look and feel. On average, siding installation cost is $7-11 per square foot for composite materials and installation. Keep in mind that prices vary depending on the type of siding you want. Typically, traditional lap siding is the cheapest, while architectural panels are most expensive. Also, don’t forget to budget for the removal of old siding. This can cost you as much as $1,000-3,000, depending on the size of your house. Make sure the price quote includes all labor, removal and dumpster fees. 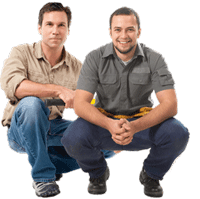 For proper installation, its best to hire a contractor who specializes in wood siding. Ask for references of previous projects, and if you can, drive by to see the houses the contractor worked on. You want to be very careful when vetting pros, because even the most expensive siding can fail, if its not correctly installed. Manufactured wood is a relatively new material compared to time-proven options, such as vinyl and Hardie. Because of its growing popularity, you will find many different brands springing up everywhere, offering attractive low prices. It is important to keep in mind that NOT all wood composite siding is the same quality. Unlike fiber cement and vinyl siding, which is made using largely the same material formulation, engineered siding can be produced in many different ways. The manufacturing process and materials used will greatly impact the durability and longevity of the siding, its ability to withstand temperature fluctuations and remain color fast under UV rays. So don’t be fooled by very cheap prices of synthetic wood. It most likely means that the product is new, low quality and will not protect your house very well. It is best to pay more and choose well established manufacturers, such as the ones discussed below. 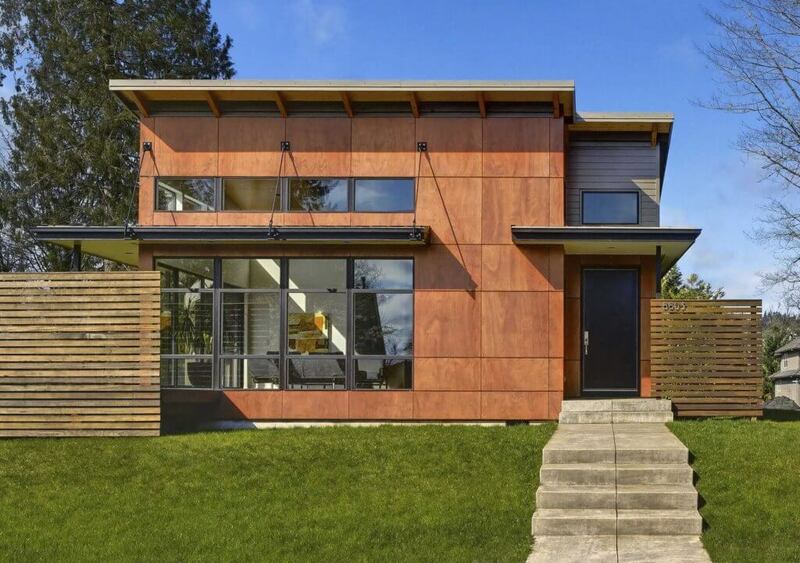 When considering different siding materials, you may be wondering why choose engineered wood. When compared to real wood, the difference is obvious; you get a lower cost and minimal maintenance. However, when it comes to high quality fiber cement or vinyl siding, the comparative advantages of faux wood become less obvious. For the most part, costs are similar, as are durability, longevity and fire ratings. One big reason many homeowners and builders want this siding is because it is more environmentally friendly than vinyl or fiber cement. Many manufacturers use recycled wood or other waste from wood production. If this is important to you, make sure to check with the manufacturers; some products contain all new wood materials. Another huge reason people like composite wood is aesthetics. Everyone now is in the business of replicating the look and grains of real wood, but at the end of the day, it comes down to personal preference. Some products look attractive and others just don’t. Compared to vinyl or fiber cement, many people really like the sleek, smooth and uniform look of wood composite. Here is a list of the most popular types of synthetic wood siding. Included are material prices as well as best manufacturers. Traditional lap siding remains a top choice for the majority of homeowners across the US. Today, among many great products available, there is also engineered siding to consider. If you are looking for a high quality material from a reputable manufacturer, your best bet is LP Smart Side. This siding has a rich grain cedar texture and longer length panels, so that there are fewer seams. LP easily competes with and often outperforms James Hardie. Another beautiful option is Truwood. You can select from cedar impression Cottage, Beveled, Sure-Lock, Self-Aligning, and Channel Rustic Lap siding profiles. With so many choices, you are sure to find a truly custom look for your house. Also, the installation process uses concealed fasteners, for a more seamless appearance. If you want to clad a premium property with classic Dutch lap siding, you will love the luxurious look and feel of Trespa. 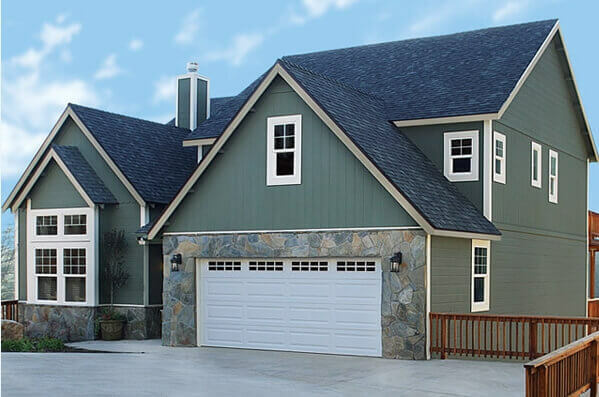 This is one of the leading companies that specializes in high-end composite exterior siding panels for both commercial and residential needs. Their lap siding line is called Trespa Pura, and you can select from 14 stunning colors that replicate both domestic and exotic woods. Moreover, their advanced manufacturing process uses up to 70% of natural wood fibers. Wood shingles and shakes never go out of style, offering old-world charm and unbeatable curb appeal. Shingles look beautiful on their own, or as an accent, combined with other types of siding. This style is most associated with Cape Style homes, Colonial Revival, and Victorian style house architecture. One of the most beautiful engineered shingles and shakes is manufactured by Collins Co. You can choose from staggered or split edge style shingles, as well as cedar shake profile, which offers the look of authentic hand-split shakes. This product is usually specified if a homeowner or builder is looking for a high-end look for a premium property. As a less fancier alternative, LP offers cedar shake siding with either a straight or staggered edge. It is manufactured pre-primed, so you can choose your own colors. You can trust the quality, because LP is one of the biggest siding manufacturers in the US, and is currently Hardie’s biggest competitor. Vertical siding is a great option for both modern and traditional Cape, Colonial and Barn Style Homes. It can also make an interesting accent on any architectural home style. Many contemporary houses make use of vertical siding panels as well. Truwood siding offers a 7/16″ and 1/2″ vertical panel that closely replicates the look of natural cedar wood. These panels have a beautifully textured and highly paintable surface, so that you can create your own custom look. This siding and trim products are highly durable. They are treated with a proprietary technology EcoGuard™: a zinc borate process, which makes the boards resistant to mildew, rot and termite damage. One siding type that has been popping up everywhere is architectural panels. These panels are very versatile, because they look equally beautiful on contemporary homes, and as accent sections on rustic or classic style homes. They are ideal in mixed material siding designs, and can be paired with metal, stucco, stone, brick and other materials. Architectural wood panels come in a wide range of sizes, depending on your design needs. Interestingly, most architectural wood panels are actually not made of real wood! This is because it is very difficult to find wood planks that are large enough to serve as panels. Additionally, sourcing these panels from real wood would be extremely expensive, and not cost-effective if you need to cover a large area of your home. Also, another challenge is that since wood panels are not typically designed to overlap with one another like lap siding, you will end up with holes in between the boards. This in turn will lead to moisture infiltration, mold and rot. Consequently, large building products manufacturers offer beautiful wood-like architectural panels made from fiber cement or synthetic wood. These products have the desirable look of wood, without any of the associated maintenance and durability issues. The cost of architectural panels varies greatly depending on the material and manufacturer. Prices can range from $6-20 per sq.ft. and up, not including installation. 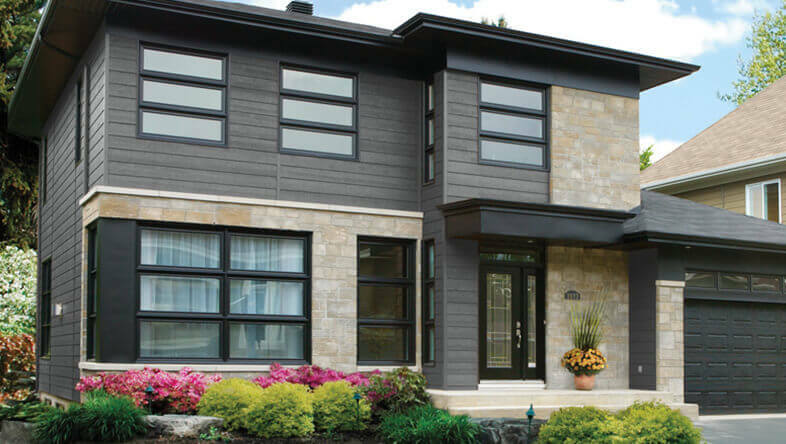 High end homes and condos usually use companies such as Trespa and Parklex – both produce engineered panel siding. With these companies, you can expect to pay about $17-20 per sq.ft. just for the panel alone. Keep in mind that the installation of architectural panels is also very expensive, due to complexity of labor required. Thus, the total cost of your siding project can be well into the range of $30-35 sq.ft.. These prices are so high primarily because there is almost no competition from other building products manufacturers. Their biggest competitor is Nichiha, a large Japanese siding materials company, which produces architectural panels from fiber cement. Another reasons is that these panels boast cutting edge technology and stunning wood replica designs. Consequently, they are usually installed on luxury homes, condos, and large commercial properties. Trespa launched an innovative line of architectural siding panels in 1994. You can select from a wide range of panel sizes, different thicknesses and 29 stunning wood finishes that replicate the looks of both exotic and domestic woods. Trespa siding is made using a proprietary technology that combines up to 70% natural wood fibers and thermosetting resins, which are subjected to very high temperatures and pressures. At the end, you get a very stable, dense panel, that is highly resistant to dirt accumulation, sun, rain and other adverse weather conditions. Another high-end panel is manufactured by Parklex, a European company that has been manufacturing composite wood products for over 40 years. These panels are available in 8 different thicknesses and 8 gorgeous wood veneer finishes. Another huge benefit is that Parklex can be installed on curved walls! They are designed to assure the highest level of water protection, thermal insulation, acoustic, solar and adverse weather protection. If you are into using green building materials, you will love KlipTech. For 17 years, this USA company has been a pioneer in using recycled products to manufacture a wide range of building supplies, including siding. Called EcoClad, this siding is made from rapidly renewable bamboo fibers, mixed with 100% post consumer recycled paper fiber. Also, their 50% plant based resin formula does not contain any harmful VOC’s, benzenes, or urea formaldehydes. In fact, EcoClad siding has the highest degree of LEED point contribution of any cladding product available today! It is available in over 300+ wood grain and color options, and boasts a 10 year product warranty. Moreover, EcoClad siding has superior durability and strength, thanks to a proprietary LOW PRESSURE HI-FLOW technology. Over the years, KlipTech has won numerous awards, including a 2009 Building Magazine Top 100 Product Award, as the top Exterior Cladding Manufacturer. 5. Tongue And Groove Siding: $3-6 per square foot. 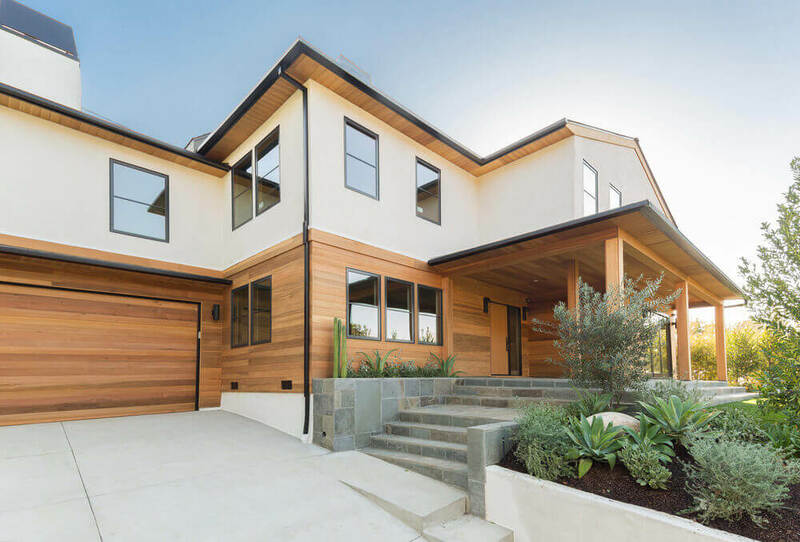 Another type of siding ideal for modern architecture, is tongue and groove. This siding looks very attractive on Contemporary,Transitional, Cabin and Ranch style homes. Shakertown offers a line of engineered Red Cedar tongue and grove paneling called Dolly Varden. The company has been laminating cedar to exterior backing for 60 years, so you can be sure you are getting a high quality siding. The panels are composed of genuine Western Red Cedar and are bonded under high pressure into a thick 7-ply engineered panel, using very strong adhesives. Moreover, you can order these panels factory pre-finished, or they can be sealed and stained on the job site. NewTechWood manufactures another noteworthy tongue and groove wood panel. This durable siding is made from a capped wood plastic composite, that offers high stain & UV resistance, as well as ultra low maintenance. You can choose from a beautiful array of 10 natural wood looks, such as Maple, Oak, Teak, Ipe, Walnut and more.